It's been one year since I last wrote on my blog. I hadn't planned on taking a sabbatical. I don't think it was a coincidence that my last post was about the word I chose for 2015 -- WAIT. It was a beautifully hard year unpacking the word and understanding its impact on my life. Even now, I wouldn't say that waiting is my favorite thing. And certainly my blog suffered for it. But waiting is a necessary skill, drenched in patience and trust. Both of which I struggle with. The do-er in me tends to jump in and take care of business, but as I practice boundary setting in my life I realize I need time. I'm allowed time -- to think, listen, and wait. 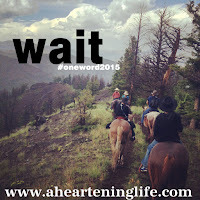 There were times I thought about blogging last year, but I felt an overwhelming sense that I should just wait. I'm not sure why. Maybe I'll never know exactly. It's now the first week of January 2016 and the freshness of the new year has yet to wear off. I wondered if I would choose a word this year and what it might be. So I waited. And all I heard was silence. I was toying with a few different words, but nothing seemed to fit. Until today. 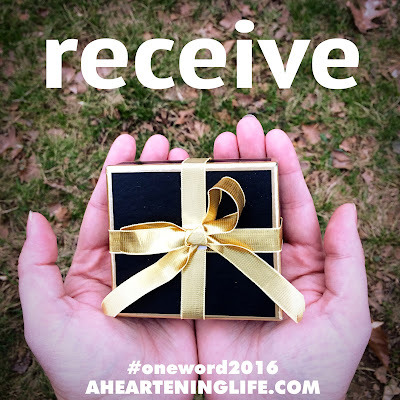 It came wrapped in a beautiful package of tears and trepidation, and I knew as soon as I heard it that this was my word, part of my journey for the year. Receive. This is the word God chose for me. Joining fruitful, esteem, and wait in the line of words God has used in the past 3 years to show me new things about myself. There is a thread of doubt tangled up inside my heart. It wonders if God will take care of me. It questions whether I'm even deserving of it. The receiving of grace. Of provision. Of love. The price He paid -- the hardest of all blessings to receive. In the everyday, in relationships, when I'm in need -- do I ask for help? Do I deny others the opportunity to love me in real and tangible ways? Receiving is hard because it's inconceivable to me that people would care that much without reciprocation. I deflect compliments and minimize my needs. I'm blinded by my perceived self-sufficiency. Receiving carves away that pride. I have to humble myself in order to receive. And believe I am valued, not because of what I do, but because of who I am. I want to learn how to receive well. To be better at saying yes to love and care and good gifts. Without strings or IOUs. But instead with open hands. Open hands. To simply receive. What's #oneword365? Click the pic to find out more. Hi Christy. I like your word and need also to work at these things. It's not unlike my word for this year - open. I want to open my heart more to Jesus' love and healing. To expose those stuffed down broken places to the liniment of His love and grace. May God fill you with His love and ever deeper healing in 2016! I love your word! Every single word carries such an array of life things... Heavy idea.